Gillian Devereux checks on the children once more before bedtime this week at No Tell Motel. Emma Ramey wonders who cries when she waves her hand in front of her face this week at No Tell Motel. Donald Illich hears a gurgle, then a stomp of a three-ton baby's foot this week at No Tell Motel. Shira Dentz is warbled warbled warbled warbles in her triangle this week at No Tell Motel. 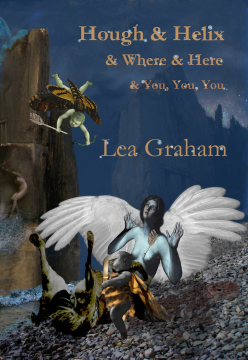 Hough & Helix & Where & Here & You, You, You by Lea Graham Available Now! Joseph Harrington waits to ascend through the skylight this week at No Tell Motel.